The Scandit SDK supports the following 1D and 2D barcode symbologies. Configuration options for each symbology can be found on the C API symbologies page. Details about the supported GS1 Composite Codes can be found on the Scan composite codes page. Also known as Japanese Article Number (JAN). Encodes a Global Trade Identification Number (GTIN). Encode additional product data like issue number, date or price. Can only be used in combination with an EAN-8, EAN-13, UPC-A or UPC-E code. EAN-2 encodes two digits, EAN-5 encodes five digits. Additional information can be found on the Scan add-on / extension codes page. 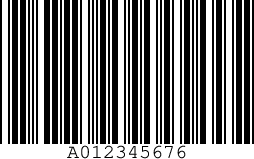 The barcode data can be encode numerical data only or two different subsets of the ASCII table. Combinations of the three different modes can be used in a single code. A mandatory checksum is verified. It has been standardised under ISO/IEC 15417. Includes support for EAN-128 and GS1-128. It is used for labelling pharmaceutical products in Italy. Also known as Italian Pharmacode, IMH, Codice 32 Pharmacode, Codice Farmaceutico Italiano and Radix 32. Last digit serves as a mandatory checksum. Narrow to wide bar ratios of 1:2.5 is recommended. Support has been added in the SDK version 5.9. The standard version can encode numbers 0-9, capital letters A-Z, symbols -.$/+% and space. By default no checksum is verified, but an optional mod43 checksum can be enforced. All ASCII characters including control characters encoding support can be enabled on demand. It has been standardised under ISO/IEC 16388. Alternative names for this symbology include Leitcode, or Identcode. Both of these have a mandatory mod10 checksum. Primarily used for labelling telecommunication equipment. Also known as USD-8. The barcode data can be encode numerical data, the dash and dot character. For up to 10 data digits a single check digit is used, otherwise two check digits are used. Also known as Standard 2 of 5, Industrial 2 of 5 or Discrete 2 of 5. Support has been added in the SDK version 4.13. Different checksum algorithms are in use, though they are not standardized. Supported optional checksums are a mod11 and mod16 checksum. MSI is used primarily for inventory control, marking storage containers and shelves in warehouse environments. Encodes any number of numerical characters. By default a mod10 checksum is verified. Alternative supported checksum options are mod11, mod1010 and mod1110. Data encoding modes support numeric, alphanumeric, binary data and kanji characters. Different sizes (called versions) and error correction levels can be defined. The Scandit SDK supports Model 2 codes including color inversion, mirroring and GS1 data content. It has been standardised under ISO/IEC 18004. Encodings and sizes defined in the Data Matrix ECC 200 standard are supported. It has been standardised under ISO/IEC 16022. The decoder supports the Data Matrix Rectangular Extension (DMRE) as defined in the AIM-D Symbology Specification Revision 1.01. Data Matrix code are often used for direct part marking (DPM). For scanning these types of codes, it is recommended to enable the direct_part_marking extension_mode. Used in a wide range of applications such as transport tickets and document processing. Truncated PDF417 (Compact PDF417) codes can be used to save space. It has been standardised under ISO/IEC 24778. It has been standardised under ISO/IEC 16023. Public Domain optical data carrier designed to be printed reliably at very high speed. Flexible code shape: rectangular codes of virtually any size and width/height proportion can be used. Strong error correction by using message encoding inspired by Code 128 and strengthened by Reed-Solomon. Allows to apply real time data with GS1 application identifiers, such as expiration date, lot number and serial number to products at production line speeds. It has been standardised in the AIM specification AIMD013 Revision 3.0. Postal code symbology used by Royal Mail and Singapore Post for encoding the destination address. It enables UK postcodes as well as Delivery Point Suffixes (DPSs) to be easily read by a machine at high speed. Uses a checksum digit for verifying data. Uses the same symbol alphabet as RM4SCC. Does not use a checksum for data verification, nor does it have a start/end pattern. KIX codes can be read from left-to-right or right-to-left. Depending on the reading direction, the data is completely different. To determine which of the two orientations is correct, the Scandit BarcodeScanner SDK matches the data against a set of encoding rules and returns the data that matches the rule. Uses Reed-Solomon error correction. It can correct up to 8 erasures or 4 errors. LAPA can be read from left-to-right or right-to-left. The direction can be determined by reading the leftmost or the rightmost bar. Thanks to its fixed length and error correction, it offers better robustness than RM4SCC.